Sun, summer, and smooth skin all seem to go together! If you haven't gotten your exfoliating in yet and are headed to the beach, don't fret; you can do it when you get there! Sand is free, a natural exfoliant, and comes with great benefits. I have used sand at home mixed with olive or oil or coconut oil and a small amount of glycerin, to create a highly effective exfoliant scrub. This can also be used on the body and especially great for the feet. 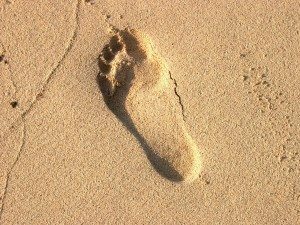 The most obvious benefit comes from a barefoot walk on the beach. Walking on the beach nourishes and soothes the soul as well as exfoliating and soothing the sole. While at home I like to take advantage of the cache of sand I have stored like gold. I have it in boxes and apothecary jars that make me look like a hometown pharmacy. It seems anytime I embark on a trip where water and sand are involved, I am lugging home a bit of it. I've got sand anywhere from Waikaloa, HI to the Florida Keys. I encourage you to bring some home with you. If you do plan to get to the beach, be sure to prepare and take advantage of the opportunity that presents itself to pamper your body with the abundant natural resources of sand. Your skin will exude radiance and shimmer in the sun like never before. Bring with you a soft body brush and a moisturizer as the sun and sand together can be most drying, especially if you are prone to dry skin already. If you find yourself at the beach without a body brush, no worries. Using your hands, scoop up a bit of sand, watching for any glass or dangerous objects and rub onto your skin, one body part at a time. Scrub gently and rinse off with plenty of water. Pat dry and apply a good quality moisturizer and sunscreen. You can also use soaps that have sand in them, or you can make your own. Start by mixing one-quarter cup of clean sand into a 6-ounce bottle of your favorite body wash or soap. One of my favorite liquid soaps to mix with sand is Bath and Body Works Exotic Coconut. This is great for the shower! If you have a partner, ask them to wash your back, then return the favor! While exfoliation is the foundation of glowing skin, too much of it can actually dry or irritate the skin. Gentle exfoliating once a week is a good place to start. Always follow up immediately with a hydrating cream for the face to replace any moisture lost during the exfoliation process. A quick tip- If you are hitting the beach all the time, designate a jar of face cream and a bottle of moisturizing lotion for your beach cooler bag, as well. Keeping it in a cool place will prevent spoilage from excess temperatures.